The next issue of Boom! 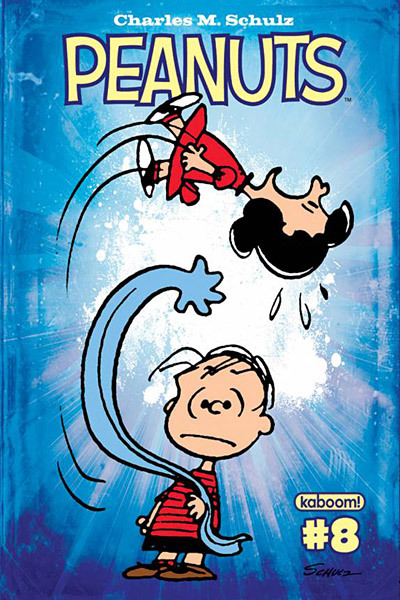 Studio's Peanuts comic book arrives on Wednesday, April 24, 2013. The stories in Peanuts #8 are "Ha Ha Herman," "Missing Peace," and "Lone Beagle," accompanied by a handful of classic Sunday Peanuts comic strips. See a preview at ComicVine. As always, you can find the latest of issues of Peanuts at your local comic book store, or order it from Boom! Studios' website. The Peanuts comic book will be taking a vacation next month, but will return in June.